Our cell survey app is designed for projects where you wish to do a survey of cellular performance in a particular area, such as in a disaster zones, to identify spots with lack of coverage or for drive-testing to test out how your cellular networks are performing in real-world conditions. 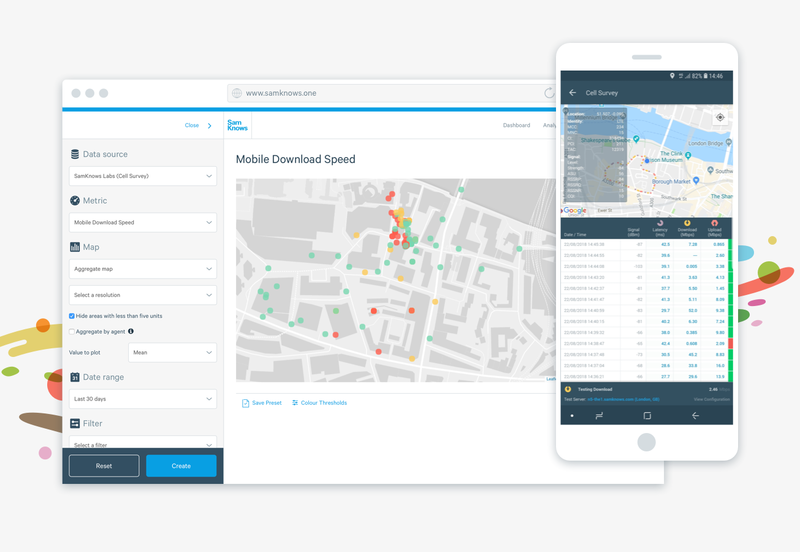 It includes a vast array of environmental data and will continuously run download, upload and/or latency tests in order for you to perform a survey of the area whilst on the move. Android 8.0+ are the only supported versions. We also recommend a high-performance phone, in our testing we utilise a Samsung Galaxy S8. We also recommend that phones are not kept on top of each other as they can become warm after long period of intensive testing and the phones may restart. The measurements included in the SamKnows Android SDK are Download/Upload throughput, Latency, Jitter, and Packet Loss. You can specify which tests you wish to run and it will execute them in cycles. Each cycle will be in the order: Latency, Download, Upload omitting any not enabled test. The inter-test delay, which is the time delay between individual tests in a cycle. The default is 10 seconds. The inter-cycle delay which is the time delay between different test cycles (a cycle consists of one run of all the enabled tests). The default is 10 seconds. The minimum delays are 5 second and maximum delays are 999 seconds. Test servers for the project will be defined in a target group and the closest ten (or less) to a mobile device by geolocation will be returned to the device. The device will then list them along with their associated latency results from an ICMP ping. The user can then select the specific test server they wish to test against and that test server will be used for the duration of the test. All results are submitted to SamKnows One. Results are submitted at the end of every test cycle, if it was unable to submit results (for example due to poor network connectivity) then it will cache the result and submit them next time the app is opened. You can see if a result has been submitted or cached as it will show with a green or red icon on the right hand side of the test results screen. If you're experiencing issues with results being submitted (they are showing up as red) due to network issues, simply open the app later on whilst connected to Wi-Fi and all cached results will be submitted. warmup_bytes Bytes transferred for all the TCP streams during the warm-up phase. Environmental data is collected at the beginning and end of a test. Therefore all fields are prefixed with beginning or end. When there is no prefix, it is data from the end of the test. During a test run environmental data and points are plotted on a map. It also includes a grid which shows test cycle download, upload and latency results. The cell survey app will be pushed to respective users via Fabric, the deployment platform that allows app version to be pushed to custom distribution groups. Email addresses of the users requiring the app should be provided to SamKnows ahead of release. Invites will be sent requesting the user install Fabric and once complete the app will be pushed to the device.